Life with robots has now become the norm. By interacting with robots, thus creating a synergy between humans and robots, our daily lives can be much enhanced. Co-habitation with robots can bridge social challenges that we face, from supporting the aging, providing assistance to disabled people to accessing high risk areas such as nuclear power plants in need of decommissioning. Japan has been in the forefront in introducing robotic technology to remedy some of these pressing concerns. In the second year of our Toshiba Lectures in Japanese Art and Science series, we are bringing to the United Kingdom two of the leading figures in robotics to discuss not only the process of ‘making things’ but also of ‘making things happen.’ One scientist and one product designer will devote an evening to providing a rare glimpse into the intellectual design and production process of robots that is taking place in Japan. The evening will also welcome a special guest, Halluc Ⅱχ, a semi-autonomous mobility robot from Japan. Please note that the Norwich lecture will be repeated in London and given in Japanese. Simultaneous interpretation will be provided. Admission free. All welcome. Places are limited and booking is essential. Furuta Takayuki is the General Manager of Future Robotics Technology Center at Chiba Institute of Technology. He is one of the leading figures in the robotic industry with a special interest in human-centred robotics. His work centres around working with businesses to develop seed projects for new industries and applying technology to overcome social challenges. 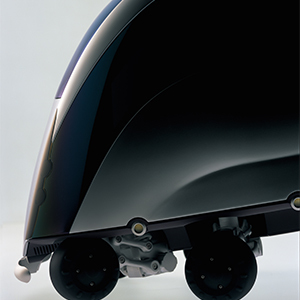 From Sakura–a reconnoitering mobile robot–developed to survey the interiors of the devastated Fukushima Daiichi nuclear power plant, to ILY-A, an ultra compact mobility scooter that enhances the lifestyles of mobility restricted youths and the elderly, Furuta and his team place user-centered approach at the heart of exploring the future with robotics. Yamanaka Shunji is a professor at the Institute of Industrial Science at the University of Tokyo. He studied engineering and worked for Nissan Motor’s Design Center before launching his successful career as an independent designer. He is the Founder and Director of Leading Edge Design. Producing some of the leading young talent in the industry, Yamanaka has taught at Keio University and is currently teaching at the University of Tokyo. His work is wide ranging–from Issey Miyake’s OVO wristwatch to carbon fiber foot prosthetics for athletes. Yamanaka has received a number of awards including the Good Design Award, and his work has been accessioned by major museums including the Museum of Modern Art, New York.